Hello, my name is Mireya Marroquin Dunn. I have been following MommyMaestra for almost two years. I have found her website to be very insightful. Some of the materials that are reviewed are geared for preschoolers & elementary grade children. However, I have been able to find some useful materials online for older kids. I have been homeschooling my teenage son for about 2 1/2 years. He has Dyslexia. I could not watch him struggle anymore at a public school (brick & mortar) class setting with his learning differences, and private school was just way too expensive to fit into our budget. In his high school curriculum, he is required to take a health class for a credit in order to graduate from high school. Since I have to find different approaches to teach him, I have looked for materials that have audio readings or videos for him. 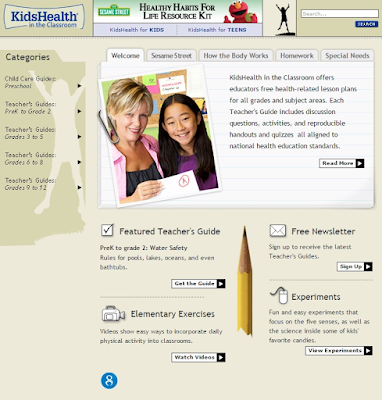 I was so thrilled when I found KidsHealth.org. 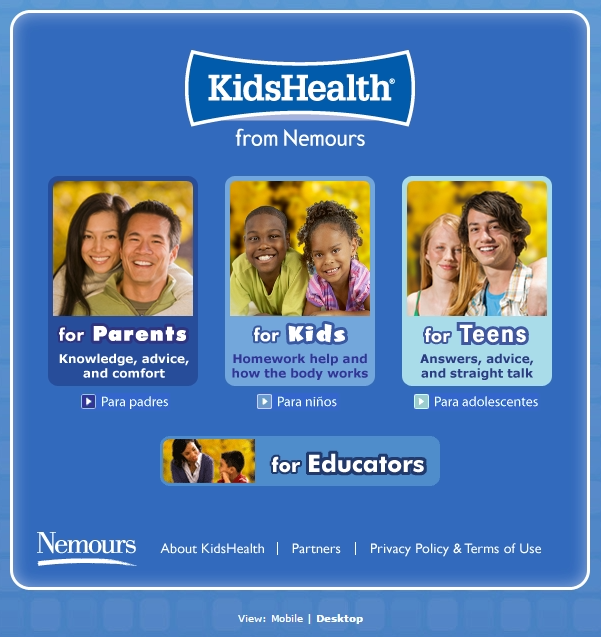 This site is supported by the Nemours Center for Children's Health Media, which is a part of The Nemours Foundation. It's a nonprofit organization created by philanthropist Alfred I. duPont in 1936 and devoted to improving the health of children. and, (what I find very resourceful for my son) answers, advice and straight talk for teens. What is so great about this site is that these articles are available in audio; just click on the speaker button. It reads the text for you in a computerized tone, but it's still easy for my son to follow along with it. There is an array of topics such as Food & Health, Sexual Health, Drugs & Alcohol, School & Jobs, and many more. They stay on top of the "Hot Topics" or recent issues our world is dealing today. There is even a link for educators. 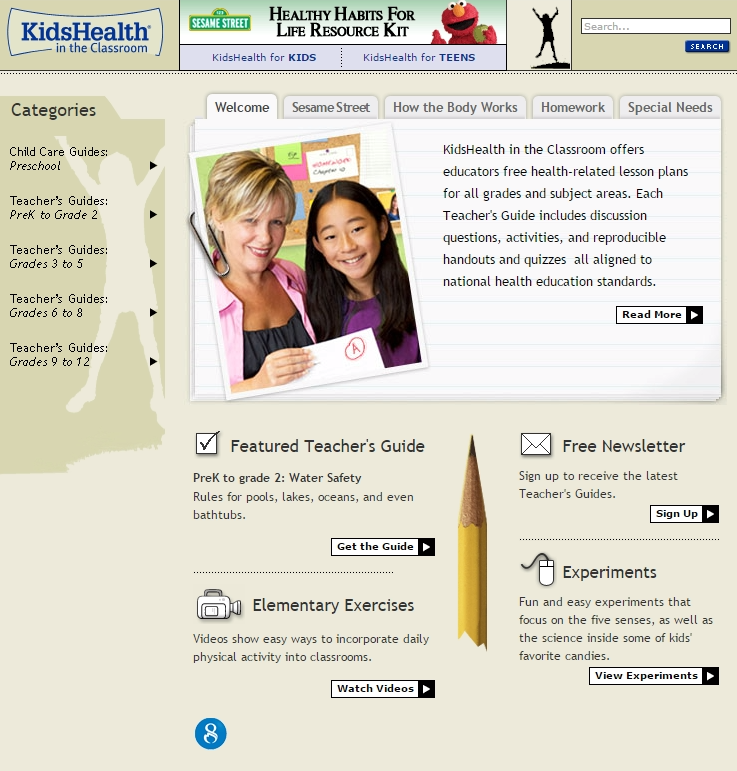 KidsHealth in the Classroom offers educators free health-related lesson plans for all grades and subject areas. Each Teacher's Guide includes discussion questions, activities, and reproducible handouts and quizzes – all aligned to national health education standards. I have to admit, I use these guides to discuss these issues with my son. This site even has videos on certain topics. It offers a Q&A feature and even recipes. You can even access it on your mobile devices. A big plus is that the site is available in Spanish (with audio! ), as well. This site, in my opinion, gives great information about health for all ages.